Would you like a private traditional yellow tram for your incentive or tour group to discover the narrow streets of Lisbon? It’s the best way to see the Portuguese capital and Inside Tours DMC can arrange it! The trams in Lisbon have been in operation for over 100 years and are one of the most traditional and authentic ways to visit the city. The tram moves on rails which usually run through the oldest parts of the city. Inside Tours DMC in Portugal organizes tours with these trams exclusively for groups who want to experience the authenticity of Lisbon. 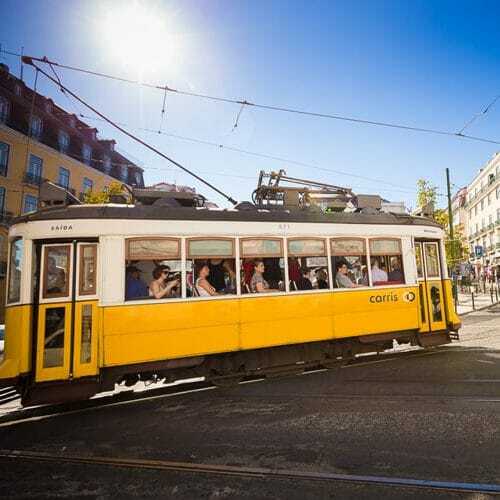 We offer routes like the famous 28 line which passes through the oldest hidden areas of the city, like Graça (next to the castle S. Jorge and offering spectacular views as it’s located on the highest hill of Lisbon) and Alfama (the ancient medieval neighborhood of Lisbon and birthplace of Fado music) or on the beautiful river side line, that will take groups to the famous Belém area with monuments like Jerónimos Monastery and Belém Tower. Our tram tours always include a local guide telling interesting stories and sharing the rich culture of the area where the tram is passing. We can also include hostesses dressed in typical Portuguese costumes, such as “Minhotas,” serving tastings of traditional products like “Pasteis de Nata” (custard tart) and Porto wine during the tour. You can complement your tour with entertainment on board like Fado (Portuguese musical style). The tram can also be added as part of an Amazing Race team build in the city for corporate groups. Unique cruise sailing on grass – only in Poland! Noma Restaurant is back in Copenhagen!